Aquaculture is the fastest-growing food production sector in the world. With demand for seafood increasing at astonishing rates, the optimization of production methods is vital. One of the primary restrictions to continued growth is the supply of juveniles from hatcheries. Addressing these constraints, Advances in aquaculture hatchery technology provides a comprehensive, systematic guide to the use of current and emerging technologies in enhancing hatchery production. Part one reviews reproduction and larval rearing. Aquaculture hatchery water supply and treatment systems, principles of finfish broodstock management, genome preservation, and varied aspects of nutrition and feeding are discussed in addition to larval health management and microbial management for bacterial pathogen control. Closing the life-cycle and overcoming challenges in hatchery production for selected invertebrate species are the focus of part two, and advances in hatchery technology for spiny lobsters, shrimp, blue mussel, sea cucumbers and cephalopods are all discussed. Part three concentrates on challenges and successes in closing the life-cycle and hatchery production for selected fish species, including tuna, striped catfish, meagre, and yellowtail kingfish. Finally, part four explores aquaculture hatcheries for conservation and education. 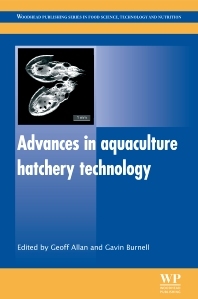 With its distinguished editors and international team of expert contributors, Advances in aquaculture hatchery technology is an authoritative review of the field for hatchery operators, scientists, marine conservators and educators. Geoff Allan is the Executive Director of Fisheries NSW and Director of the Port Stephens Fisheries Institute for the NSW Department of Primary Industries, Australia. Gavin Burnell is Professor at University College Cork, Ireland, and Editor-in-Chief of Aquaculture International.